The New York Sun. November 11, 2002. "Are you working on Monday?" asked the woman in the shop where I get my morning cup of coffee. "Ah well," she said, "it’s a small holiday." It is a small holiday, tucked in between the three day Columbus Day weekend and the four day Thanksgiving weekend. But as Veterans’ Day this year actually falls on the day of the Armistice, we might occasionally find ourselves disposed to think, in the course of shopping or playing golf or doing the household chores or driving home from grandma’s house — of what happened on the eleventh hour of the eleventh day of the eleventh month in 1918, and why the day was kept for at least a generation afterwards for the most solemn ceremonies of remembrance. Nowadays we no longer have anything like the British "Remembrance Sunday" observance where the whole nation is asked to observe two minutes’ silence. America, the land of Henry, "History-Is-Bunk," Ford, has always seen itself as forward-looking and disinclined to dwell on the past, but two minutes seems less like dwelling than popping one’s head inside the door and saying "Hi!" 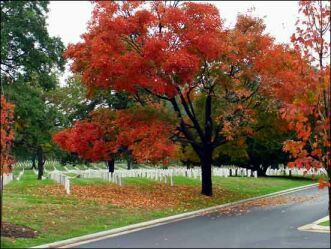 Even more remarkable is the fact that, at a time when distinguished American veterans of the Second World War are dying every day, there is almost no reflection of the fact in the obituary columns of the New York Times, our "paper of record." §Lt. Gen. Sir Napier Crookenden who led one of the glider attacks that secured the Orne bridges for the Normandy landings. When he joined the first wave he brought with him copies of the early edition of the Evening Standard "so that troops who had landed by glider before dawn could read press accounts of their exploits that same evening." Later, upon assuming command of a battalion of the parachute regiment, Crookenden is said to have maintained the battalion’s reputation for fighting ability "by example, and patrols probing enemy lines would often find that the commanding officer was one of their number." §Lt Col Stuart Townend, an Olympic-standard athlete whose father had been killed in the First World War and who, commanding a battery of the Royal Artillery after D-Day, was mentioned in dispatches before being wounded on account of refusing — "characteristically" in the words of the Telegraph obit. — to take shelter in the middle of shaving when his position came under mortar fire. He was among those who liberated the Buchenwald concentration camp and after the war became the eccentric (every day drinking 10 cups of tea with eight lumps of sugar in each and 12 cups of Ovaltine with five lumps in each and smoking 30 cigars) founder and owner of a prep school attended by Prince Charles." §Peter Cairns, who was one of the youngest airmen to qualify as a pilot during the war, and was awarded the Distinguished Flying Cross at 18. Subsequently, in 1943 when his Wellington bomber was shot up over the Channel while returning to England and the entire crew killed or wounded, he landed with the plane in flames on an enemy airfield in Holland. Subsequently sent to Stalag Luft Three, Cairns was due to be the last man out during what subsequently came to be known as "the Great Escape," but the prison-break was discovered in progress. §Air Commodore Brian Frow, who was returning from bombing mission in his Lancaster bomber when it was attacked by three JU-88 German night-fighters. His gunners shot down all three planes, but the Lancaster was badly shot up and was unresponsive to its controls, turning over onto its back until, only 800 feet above the water, Frow managed to regain control. After a crash-landing in Woodbridge, Suffolk the plane was found to be "riddled with more than 100 bullet and cannon shell holes." §Captain "Dag" Dickens, a distant relation of Charles Dickens, who as a 19-year-old merchant seaman served aboard the cargo ship Dorset in 1942 when she was part of a do-or-die convoy that was the only hope of keeping the island of Malta from being starved into submission by the Germans. All but five of the convoy’s 14 British and American merchant ships, including Dorset, were sunk by constant German air and submarine attacks, but the mission was accomplished. After heroic but unavailing attempts to save the Dorset, Dickens was picked up by the tanker Ohio, which itself was so badly damaged it had to be towed into harbor at Valletta. During the same period, there was no Second World War veteran who earned a place on the obituary page of the New York Times for his exploits on the battlefield, and only one American soldier: Richard Rocco from Albuquerque, an Army medic who won the Medal of Honor for pulling his fellow crewmen out of a burning helicopter in Vietnam. Wallace C. Dayton, the heir to a Minnesota department-store fortune whose claim to distinction is based on his having given lots of money to the Nature Conservancy and served on its national board, is said en passant to have "served in the Navy in World War II." Others for whose obituaries they found space of 43rd Street included Paul Leonard, an interior decorator who worked for Rachel Mellon and Jackie Onassis, Jonathan Harris, who played the evil Dr. Smith on the TV Series "Lost in Space," Mildred L. Lillie, "the longest- serving judge in California history and one of the first women on an appellate court in the state" who, said John Dean, was once "strongly considered" by President Nixon for a Supreme Court vacancy, and Peggy Moran, star of The Mummy’s Hand (1940) and Horror Island (1941) at a time when the fates of nations and peoples were being determined by, well, some other people. Of course one has nothing against department store owners, interior decorators, TV stars or judges, but wouldn’t the exploits of America’s now-dying generation of World War II veterans make for even more exciting reading over the cornflakes of a morning? Hardly a day goes by that there are not obituaries in the British papers of veterans who, without these valedictory accounts of their exploits, would be forgotten by all but their loved ones. This is what is happening with America’s heroes, nearly all of whose fascinating life stories are dying with them. That the New York Times is not interested in them can hardly be a consequence of a desire to sell papers. Americans may not be backward looking, but most of us can still appreciate a thrilling story when we read one.